If you need to modify your firewall settings, view this info. 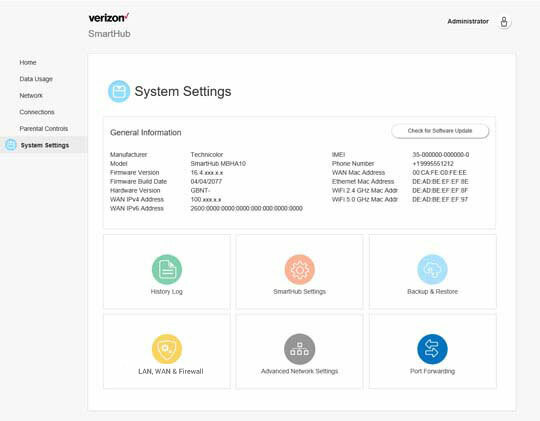 From the Smarthub Home screen, click System Settings. From the System settings screen, click LAN, WAN & Firewall . 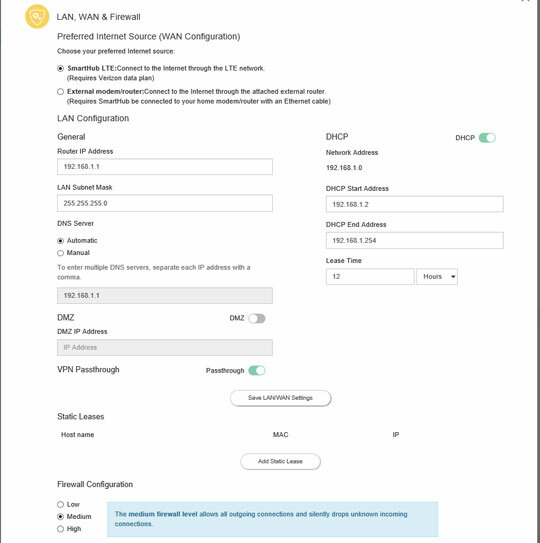 From LAN, WAN & Firewall, click the External modem/router radio dial to select and configure an alternate internet source. Contact the Internet Service Provider (ISP) or the router manufacture's customer service for help in configuring the Smarthub for External modem/router settings. Click the DMZ switch turn on then enter a DMZ IP Address. From Static Leases, click Add Static Lease. From the Host dropdown, select a connected host then enter static DMZ IP Address. From VPN Passthrough, click the Passthrough switch to turn on or off as needed. VPN Passthrough is on by default. Click Save LAN Settings to update your preferences.